Allen College continually seeks collaborative partnerships for sharing of resources and faculty expertise to enhance healthcare educational outcomes. Allen College currently has collaborative partnerships with the following institutions. An affiliation agreement between Aultman College and Allen College facilitates seamless transfer of students to Allen College. Students successfully completing general education courses can seamlessly transfer to health science programs in Diagnostic Medical Sonography, Nuclear Medicine or Public Health. Students seeking admission to other Allen College programs complete some or all of the general education coursework at Aultman. Communication with admissions, administration, faculty and staff from each college is ongoing to better serve students. Allen College also provides education for the faculty of Aultman College in the EdD program. An affiliation agreement between Central College and Allen College facilitates the seamless transfer of qualified Central College students to Allen College to earn the Bachelor of Science in Nursing (BSN) degree. Through the program, students complete general education requirements at Central College and also have the opportunity to earn a bachelors degree at Central College . The program assures qualified Central College students of admission to either the 15-month option or the 5-semester traditional option of Allen College 's BSN degree program. Information about the program is available from admissions offices at both colleges. The affiliation agreement between Hawkeye Community College and Allen College facilitates seamless transfer of students to Allen College. Students successfully completing the associate degree in nursing can seamlessly begin the RN-BSN or RN-MSN completion programs. Students seeking admission to other Allen College programs may also complete some or all of the general education coursework at HCC. Communication with admissions, administration, faculty and staff from each college is ongoing to better serve students. Many student services can prove to be mutually beneficial. Future plans for health sciences programs are being explored. An affiliation agreement between Indian Hills Community College and Allen College facilitates the seamless transfer of qualified Indian Hills Community College students to Allen College to earn the Bachelor of Health Sciences (BHS) degree with a major in Medical Laboratory Science. Through the program, students complete the requirements for the MLT program at Indian Hills Community College and then transfer to the Allen College Medical Lab Scientist (MLS) program. Information about the program is available from admissions offices at both colleges. An affiliation agreement between Loras College and Allen College facilitates the seamless transfer of qualified Loras College students to Allen College to earn the Bachelor of Science in Nursing (BSN) degree. Through the program, students complete general education requirements at Loras College and also have the opportunity to earn a Bachelor of Science degree in biology or general science at Loras College. The program assures qualified Loras College students of admission to either the 15-month option or the 5-semester traditional option of Allen College's BSN degree program. Information about the program is available from admissions offices at both colleges. An affiliation agreement between Northwest Iowa Community College and Allen College facilitates seamless transfer of students to Allen College. Students successfully completing the associate degree in nursing can seamlessly begin the RN-BSN completion program. Students seeking admission to other Allen College programs may also complete some or all of the general education coursework at NCC. Communication with admissions, administration, faculty and staff from each college is ongoing to better serve students. 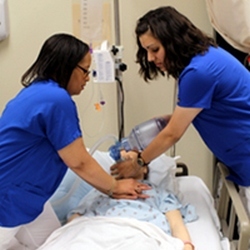 An affiliation agreement between Southeastern Community College and Allen College facilitates the seamless transfer of Southeastern Community College students to Allen College to earn either the Bachelor of Science in Nursing (BSN) degree or the Bachelor of Health Sciences (BHS) degree with a major in Public Health. Through the program, students complete the requirements for the Associate Degree in Nursing program or the Public Health program at Southeastern Community College and then transfer to the Allen College RN-BSN or Public Health program. Information about the program is available from admissions offices at both colleges. An affiliation agreement between Southwestern Community College and Allen College facilitates the seamless transfer of Southwestern Community College students to Allen College to earn either the Bachelor of Science in Nursing (BSN) degree or the Bachelor of Health Sciences (BHS) degree with a major in Public Health. Through the program, students complete the requirements for the Associate Degree in Nursing program or the Public Health program at Southwestern Community College and then transfer to the Allen College RN-BSN or Public Health program. Information about the program is available from admissions offices at both colleges. An agreement of cooperation between Allen College and the University of Northern Iowa (UNI) facilitates the education of Allen College students. Students enrolled in degree programs at AC may take courses at UNI to fulfill some or all of Allen College's general education requirements. Courses taken at and offered by UNI are accepted for transfer credit by Allen College. Allen - UNI affiliated students (defined as AC students who have been enrolled at UNI) have access to student services, international student services and activities, library, health and wellness services, housing and academic advising and other appropriate services provided by both AC and UNI following the transfer. An affiliation agreement between Wartburg College and Allen College facilitates the seamless transfer of qualified Wartburg College students to Allen College to earn the Bachelor of Science in Nursing (BSN) degree or the Bachelor of Health Sciences (BHS) degree with a major in Diagnostic Medical Sonography. Through the program, students complete general education requirements at Wartburg College and nursing students also have the opportunity to earn a Bachelor of Science degree in biology at Wartburg College. The program assures qualified Wartburg College students of admission to either the 15-month option or the 5-semester traditional option of Allen College's BSN degree program or the 5-semester BHS in Diagnostic Medical Sonography. Information about the program is available from admissions offices at both colleges. Dr. Gale Carlson serves as the McElroy Endowed Chair for Interdisciplinary Studies. Dr. Carlson leads initiatives related to community service, community engagement, and service learning. Through collaborative arrangements, Allen College provides several health services to the community. Allen College, in collaboration with the Black Hawk County Child Health Department, provides school health to 11 parochial school sites in the Waterloo area. Allen College nursing students, through community health and other related courses, provide health screenings, health education, and immunization health audits for the schools. The services provided by faculty and students are equivalent to a half time school nurse. Allen College continues to partner with the Salvation Army. Faculty and students enrolled in the senior level community health nursing course conduct a two-hour weekly blood pressure screening clinic at the community center during the free lunch program. Forty to 50 people are seen weekly/biweekly at the blood pressure clinic. The majority of the clients served are underinsured or uninsured or have difficulties with health care access. Common medical conditions include hypertension, cardiovascular disease, diabetes, and mental health disorders. Although referrals are made by faculty and students to other community resources, many of these conditions continue to go untreated for multiple reasons. Allen College also provides a foot-care clinic at the Salvation Army, which is held during the weekly blood pressure screening. Enhancement of the nursing curriculum by incorporating student learning opportunities with diverse populations. Improved care for an underserved population with the potential for subsequent reduction in foot complications and associated costs related to health resources and human suffering. Development of a collaborative multidisciplinary program involving diverse community resources, which will be instrumental in meeting other health needs of multiple underserved groups. The Healthcare Careers Consortium is a cooperative effort by Allen College, area hospitals, high school educators, Hawkeye Community College, and long term care facilities to work with students for articulation from high school to college. The focus has been on working toward dual credit courses for high school and college and evaluating the present curriculum plan for the junior and senior high school students. Hawkeye Community College, Allen College, and high school faculty met to discuss standardizing the credit received for advanced courses. Hosting Star Student Receptions for honor roll students for each grade level each quarter. Coordinating citizenship luncheons for various Logan students who are selected twice a month by teachers who they believe display the pillars of Character Counts. Coordinating Health Careers Club & Career Day. Facilitating a mentoring program (E-PALS). Sponsoring the 8th grade promotion ceremony. Hosting etiquette luncheons at Allen College for all 8th grade students.